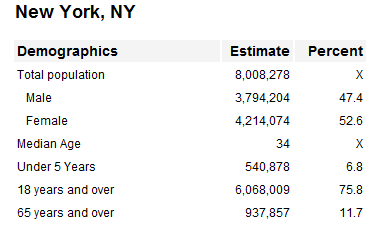 If you love finding how the estimated population of United States or even curious in checking out the demographics and economic of a particular city for example New York City. With an aim to provide everyone the statistics and detailed information of a city, iCityData compiles all the data from multiple sources (US Census, Google Maps, Wikipedia, Time and Date, etc.) and presents them to you. For each city, the statistics are being categorized into a few sections which includes demographics, social, economic, and housing. Under demographics, it shows you the total population of which how many are males and females, under 5 Years, 18 years and over, 65 years and over with their percentage. I pretty love the economic section as I can easily find out and compare the labor force, median household income and family income among cities. Besides these, there are even zip codes, area codes and a city map powered by Google Maps. iCityData is indeed a wonderful creation as user can make a comparison and find out which cities has the most number of households, highest median family income and many more. Also, it updates the data frequently and grabs them from reliable sources as to make the numbers more accurate. Currently, this free service is in beta and the popular searches are San Fernando, New York and Houston.